I’ve earlier seen hints that there are differences in men’s and women’s sleep timing. Now a new study confirms that and has also found differences in the quantity of melatonin secretion and in the daily temperature amplitude. The study participants were normal sleepers: 28 women and 28 men, ages 18-30, matched in pairs for age, habitual bedtime, habitual wake time and MEQ-results. Under strictly controlled conditions, so-called constant routine, their core body temperatures and melatonin levels were measured. 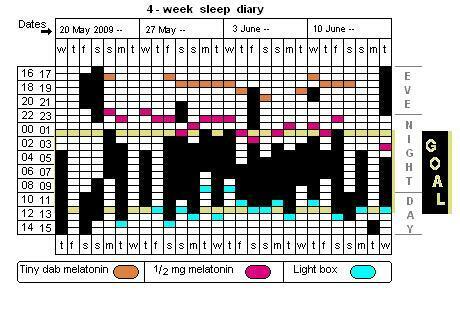 The women reached higher levels of melatonin in the blood. The men had a greater amplitude in body temperature throughout the day and night. between temperature minimum and wake time. The women were sleeping and waking at the same clock time, but at a later biological time than the men. 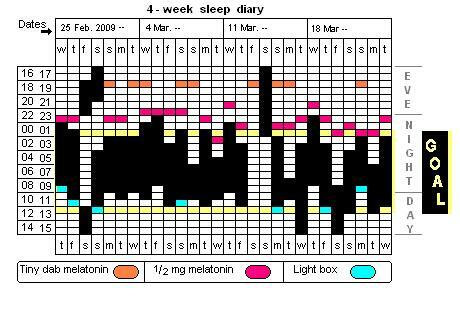 Uploading more sleep logs here, last half of 2010. It’s looking like Irregular sleep-wake disorder which usually occurs after brain injury or in dement elderly. I don’t seriously mean that I’ve earned that diagnosis and would rather blame the schedule on medication changes, the too-warm weather or something unidentified. Twice in this period (above) I’ve done my “36-hour trick”, that is stayed up for about 36 hours. These just happen unplanned for some reason. As a trial I’m using the expensive Circadin rather than the cheap melatonin for a while. The effect is at least not negative, but not much else. The hope was to get back to 8 uninterrupted hours a night. 53. Light therapy: white, blue or maybe green? It has long been known that light and dark affect the daily as well as seasonal rhythms of living things. Early in the 1900s it was assumed that humans’ daily rhythms were less affected than those of “lower” beings, but that attitude was proved wrong. In the 1980s it was noted that some totally blind people entrained perfectly to the 24-hour cycle while many did not. Until some time in the 1990s, it was not known if entrainment occurred by light to the eyes or to the skin. One research team claimed to have proven that light to the backs of the knees effected entrainment, but neither they nor other researchers could duplicate those results, which later were withdrawn. It is now clear that we and other animals entrain primarily by light to the eyes, though secondary cues such as social activity, feeding times etc. also play a role. It is also clear that our eyes contain not only rods and cones for vision but also the recently discovered light sensitive ganglion cells for the entrainment of circadian rhythms. The light sensitive pigment in these cells is melanopsin. the non-visual effects of light? If the ganglion cells’ photosensitivity contributes to vision at all, it is very minimally. But a study* published this month by well-known researchers suggests that the cones do affect entrainment, with variations dependent on the timing and intensity of the light. 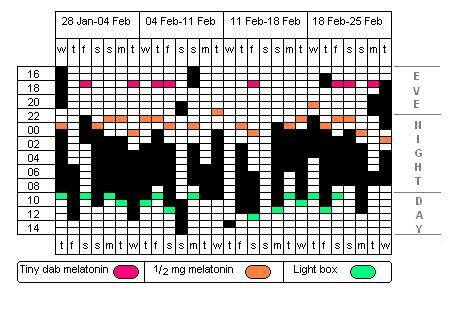 The practical implications include the question of whether the use of blue-blocking goggles in the evening, so-called “dark therapy”, really does allow normal flow of melatonin as intended. [An aside: mightn’t there be a more direct way to find this out?] In addition, the jury is still out on what color light – white, blue or perhaps green – is best to use in light therapy. In this study in Boston, more than 50 human subjects each spent 9 days in an laboratory environment free of time cues. 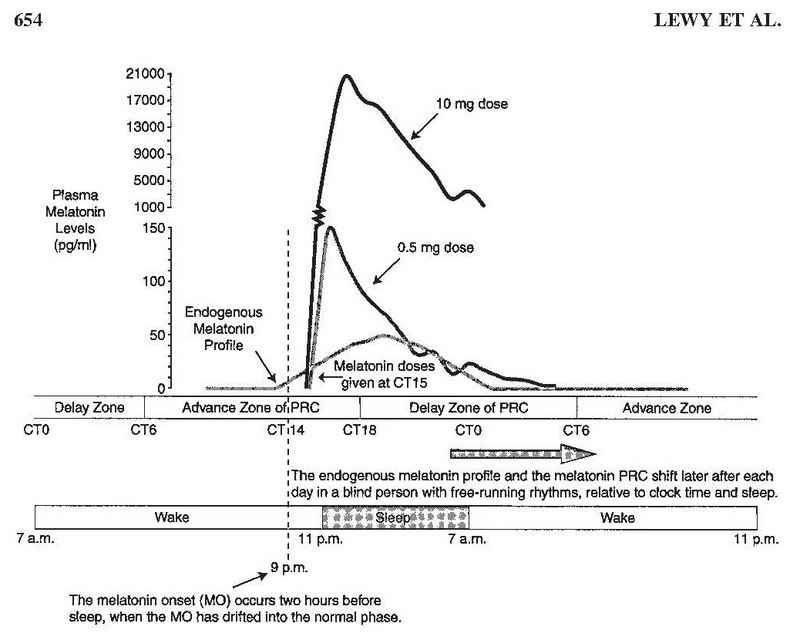 Semi-recumbent, totally confused about the time of day, and with their melatonin rhythms individually determined, half of them were exposed to blue (460nm) light and half to green (555nm) for 6.5 hours starting shortly after their own melatonin secretion started. It is well-known that blue light (including about 460 to 482nm) excites melanopsin leading to the suppression of melatonin. The question here is whether the green light may have similar or equal effects. Green was chosen because the human visual system is most excitable at green (555nm). In the figure, A and B are two subjects. 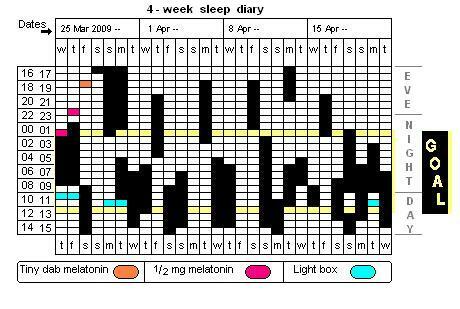 Each person’s normal pattern of melatonin secretion is repeated on the left and on the right in black. On the left, blue light acutely suppresses A’s melatonin, while green light only delays B’s for a good hour. 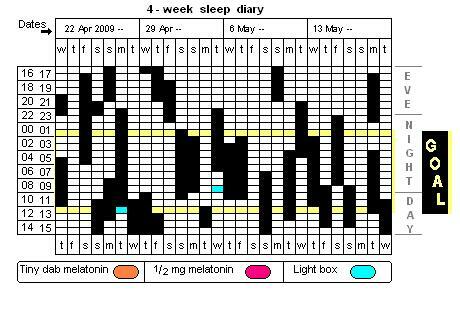 The next night, as we see on the right, the pattern of melatonin secretion has been phase-shifted by the previous night’s light exposure about equally for the two subjects (horizontal red line). From previous knowledge, one would have expected an appreciably greater delay after the blue light than the green. Depend on the Irradiance and Duration of Exposure to Light. Next post: #54. Take a Nap! As “D” gets the forms filled out, her (my) sleep logs will appear here. They are of interest primarily to myself and my sleep specialist, Prof. Holsten. But if you see a long-term pattern, do let me know. What I see for sure is that I am affected by melatonin and/or bright light. Next experiment will be to cut the melatonin and see what just morning bright light does. The doctor said: "WHAT happened here?" Umm, I just tried a couple of weeks without melatonin and light therapy, is all. Back on track, such as it is. My “normal” with the help of melatonin and light therapy. Posted by Delayed2Sleep (aka “D”). Updated 22 February 2010.